A Dan Thomas hat-trick helped newcomers Eastfield Athletic earn a 7-2 win at Scalby Reserves in Division Two. Kieran Lilly opened the scoring for Athletic on 18 minutes, a cracking solo effort, and a minute later Thomas doubled the lead for Andy Thorpe's team. Ten minutes before the interval a great finish from Paul Nuttall put the home side back in the game. Thomas restored the two-goal lead for Athletic after the interval, and the visitors then went on to dominate proceedings, Thameur Dridi scoring his first goal for the club and Thomas completing his hat-triick to make it 5-1. Sub Corey White added a sixth, and although Scalby hit a second consolation, sub Jordan Peet made it 7-2 with the last kick of the match. Thorpe, who was delighted to win on his return to his old team, said: "The men of the match were wing-back Adam Martin and forwards Dan Thomas and Thameur Dridi, but the whole team did me proud today." Snainton also hit a magnificent seven, earning a 7-1 home win against a depleted Newlands Reserves side. Ryan Collings and Martyn Kelly notched a brace apiece for the hosts, with Liam Mintoft, Leigh Watson and Connor Bell also on target. Man of the match for Snainton was Rob Holt, while skipper Dave Young was the star man for Newlands, whose goalscorer was Billy Gracie. Edgehill Reserves maintained their winning start to the season with a 3-2 home win against Goldsborough United. Benny Davis opened the scoring after 10 minutes for the hosts with a left-footed shot into the bottom corner, and the lead was doubled before the interval when left-winger Josh Fergus broke down the flank and jinked past the United keeper to tap the ball home. Goldsborough, who made the trip without any subs, started stronger in the second half and excellent work by Sam Pike set up Tom Kilpatrick to tap home to make it 2-1. Poor defending by the visitors allowed Ryan Link in to score, but Kieran Storr then fired in a second to make it 3-2. Davis hit the post as Edgehill looked for a fourth, but United nearly levelled in the dying moments, but Storr scuffed his shot when well-placed. Fergus was named as man of the match for Edgehill. Seamer Reserves earned a 5-2 home win against Eastfield Town. Nick Hegarty opened the scoring for Seamer, and the lead was doubled by Daz Hastie's cross-shot. Seamer man of the match Arran Wright netted a third for Seamer and a fourth from Graeme Reid wrapped up the win by half-time. 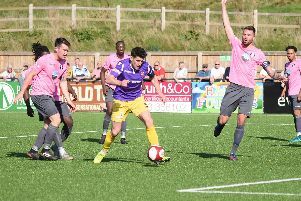 Town struck twice after the break through player-boss Joe Turner as they had the better of the game in the second period, but any hopes of a revival were scuppered by Olly Parker's goal. Jack James, Jordan Pratt and Jordan Scott all impressed for Town. West Pier Reserves worked hard for a 2-0 win at Ayton on Friday evening at Wilson's Lane. After a goalless first half, Rich Tolliday opened the scoring with a free-kick into the top corner, then a Nicko Dunn own goal secured three points for John McGough's side. Chris Ferrey was named as the Pier man of the match, pulling off a string of fine saves to repel a hard-working home side, the gloveman also showing great distribution throughout. Joe Bradshaw and Will Jones were the men of the match for Ayton. The honours were shared in a 1-1 draw between Fishburn Park Reserves and FC Rosette. Rosette started brightly and only a fine save from player-boss Carl Oliver kept them at bay. Park then opened the scoring when Azza Cook broke down the left flank and put in a beauty of a cross which Rob Ingham put in with his face. Rosette levelled just before half-time when Oliver failed to hold onto a cross-shot from Lewis Hird. Park had a strong shout for a penalty turned down when Marc Usher looked to have been fouled, Mikey Harland making a fine late save to keep Rosette on level terms, the Newby team probably being the stronger side overall. Dan Smith and Andrew Kelly shone in defence for Park, while the man of the match for Rosette was centre-back Wayne Shaw.